Left to Right, Alan Roman, Consultant; Tim Nichols, SECCRA Board Member; Bill Stullken, SECCRA General Manager; Rachel Goldstein, EPA; Scott Mengle, SECCRA Administrative Supervisor; Rick Cairns, SECCRA Board President; Bill Corbishly, Former SECCRA Board Member. 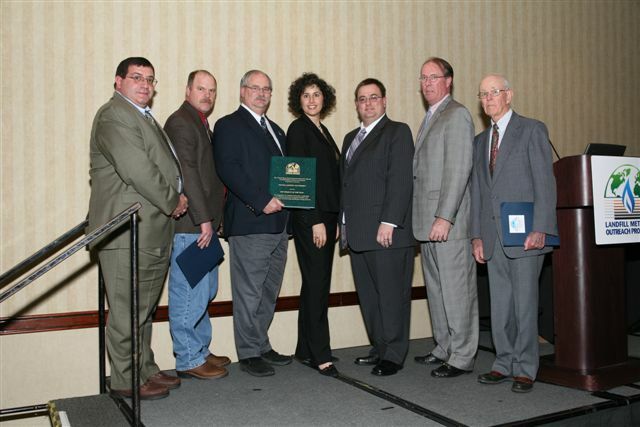 JANUARY 9, 2008; WASHINGTON, D.C. — The U.S. Environmental Protection Agency today honored the Southeastern Chester County Refuse Authority (SECCRA) with a “Project of the Year” award for its successful effort to turn landfill gas into usable electric power. SECCRA Chairman Richard Cairns was on hand to receive the award at the EPA’s 11th annual Landfill Methane Outreach Program Conference and Project Expo at the Hyatt Regency on Capitol Hill. The award is one of only three given nationally by the EPA this year. It was a year ago, in January 2007, that SECCRA launched “SECCRA Power,” using gas from its landfill as a fuel to generate nearly 1 megawatt of electricity, sufficient to power about 500 homes, and selling it to the PJM power grid. SECCRA initially invested $3.2 million in its gas-to-electricity facility, including a $500,000 start-up grant from the Pennsylvania Energy Development Agency (PEDA). The start-up included installation of a gas-collection system in the landfill, a generator that runs on landfill gas, a power line connection to the PJM grid, and an electronic monitoring system. The project was so successful initially that SECCRA announced plans in October to add a second generator to produce an additional 8.8 million kilowatt-hours of electricity per year. Another $750,000 is being invested, including a second PEDA grant of $250,000. The second generator is scheduled to be operational by the middle of this year. It’s estimated that the electricity generated from landfill gas at SECCRA will save the equivalent of 27,000 tons of coal per year. In addition, Cairns said, revenue from the sale of electricity and from the sale of renewable energy credits will enable SECCRA to recoup its investment in about four years and after that will help hold down the cost of waste disposal for local residents. The chairman noted that support from the Pennsylvania Department of Environmental Protection was a key element in the gas-to-energy project’s success. SECCRA is a non-profit municipal authority with a publicly appointed board of directors that provides solid waste disposal and recycling for about 90,000 residents in 24 boroughs and townships in the southern third of Chester County.